Put away those smartphones, Londoners. Instead, read something fab as you travel the tube, thanks to this FREE Short Story Station. 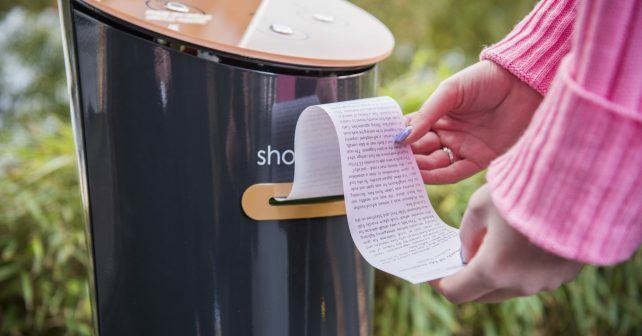 The literature print out point has popped up at Canary Wharf and all you need to do is choose your prose and press a button! Commuters can choose between one, three or five minute stories depending on your commute. This excellent idea has come over the Channel from France. There’ll be condensed classics from literary giants including Charles Dickens and Virginia Woolf plus a piece from spy writer Anthony Horowitz. Subjects covered include fiction, romance, crime and humour. There’ll also be kids’ stories too so everyone can get in on the action. Plus it’s printed on eco-friendly paper so everyone wins.